Like millions of people worldwide, I fell in love with Wonder. 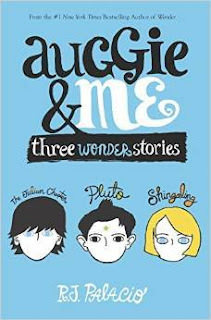 I was so excited to read more from R.J. Palacio when I got the offer to read Auggie & Me. I am not usually a huge fan of short stories, but the three stories in Auggie & Me are short stories done right. The first story is The Julian Chapter, which I admit, I was looking forward to the least. I mean, who doesn't love to hate Julian?! But, I was so surprised at the way my view of Julian changed after reading his story. I enjoyed hearing Julian's own narrative voice and found myself completely understanding where his anger and hate towards Auggie came from. Julian's history doesn't excuse his actions, and Palacio does not try to create false sympathy for Julian. She simply delves into his character and own family life, and through that narrative, the reader comes to see that Julian's behavior towards Auggie and Jack was only natural for him: he is the product of his upbringing. However, all is not lost, as Julian undergoes quite a bit of character growth in this story. His visit with his grandmere in Paris was life-changing for him, and reading her story was the most touching part of The Julian Chapter. I started this short story thinking, "I'll just get through this one quickly because I really want to read the other two," and ended it with tears of compassion for Julian and his family. Bravo, Palacio! Next comes Pluto, Auggie's friend Christopher's story. Auggie and Chris have been friends since birth, but Chris moves away before Auggie starts at Beecher Prep, so he's not there to shelter Auggie at his new school. Chris's story was just as touching as I expected it to be, and I was once again moved to tears by the end of it. I loved learning more about Chris, since he wasn't a prominent character in Wonder, at least the way I remember it. One prominent theme to Auggie & Me is that these stories are not about Auggie. They're about Julian, Chris, and Charlotte. Auggie is mentioned in the stories, of course, but in almost like cameos. The stories are how each character reacts to Auggie, and how his presence at Beecher Prep changes their lives for the better. The last story is Shingaling, and it was just so cute. Palacio delves into the "girl war" in Shingaling, and does it with aplomb. Charlotte's use of Venn diagrams just made me smile. I loved her spunky personality and her honesty. I really enjoyed getting to know the girls in Wonder better. While Shingaling wasn't as emotionally moving as the other two stories, it was still an awesome read. And the ending was just perfect. I loved Auggie & Me. It is a must-read for fans of Wonder. And if you haven't read Wonder yet, stop, drop and read that awesome, life-changing book!